Great Impressions: New Releases at Great Impressions Stamps! looking bright...but I'm super excited to share some news! it's time for a new release! This month it's all about darling babies and little ones! I don't know about you, but I adore making baby cards. did stock up on most of the others cuz their just so stinkin' cute! (grin). I added just a tad of sparkly Stickles around the lace of the shoe. Love the bit of shimmer it gives! Great Impressions Stamps. It's inked up in Linen just like the sponging around my card... after I sanded the edges. A little girly lace and a bow gives my card lotsa texture. The little ivory heart tag is from a friend and I free handed "girl" in gold above the heart punch out. All in all I think it turned out very sweet! baby cards seem to disappear around my house pretty quickly. at the Great Impressions Stamps Store. One lucky mommy will surely enjoy this card! I can see the sweet sparkle. The shoes are precious. I love all the cute baby images in the new release! Can't wait to get shopping! What a darling card. Love it. oh so sweet! Love that pretty fringy lace! The shoes...baby shoes are always so adorable! 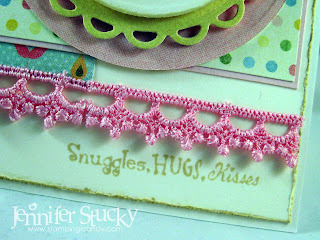 Tiny feet, tiny toes...and I love the crochet trim - great texture, lovely card, Jenny!